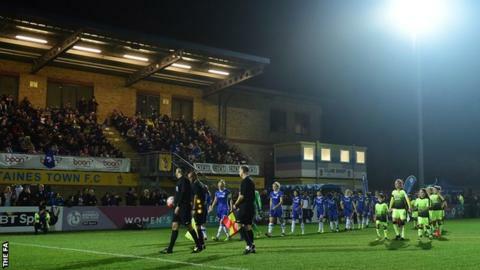 Chelsea Ladies will share League One side Wimbledon's Kingsmeadow ground from the start of the next Women's Super League One season in September. The Blues will remain at Staines Town's Wheatsheaf Park ground until the WSL Spring Series finishes on 3 June, before the switch to a winter league. In June 2016, Chelsea FC exchanged contracts with Wimbledon to buy Kingsmeadow for a reported £2m fee. Wimbledon are planning to build a new 20,000-seater stadium at Plough Lane. "This move represents a huge opportunity for Chelsea Ladies to create new memories in an area where the club already has a lot of support," manager Emma Hayes said. "We are fully focused on the Spring Series but are already looking ahead to the 2017-18 season and a fresh start at Kingsmeadow. "We have had a wonderful five years at Staines, they have been excellent hosts, and now we are immensely excited about what we can achieve in the coming years."